Made with 100% domestic whole soybeans and deep fried slowly in rapeseed oil. Inside of the puffy, light outside is a nice texture of tofu that you can enjoy. 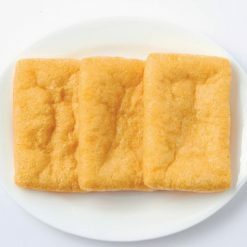 It is a soft deep-fried tofu that absorbs the flavor well. Puffy deep-fried tofu made with domestic soybeans and bittern and deep fried in rapeseed oil. As we use natural bittern (raw seawater magnesium chloride) which is low in curdling content; it has a higher concentration of soy milk compared to products by other companies. This is why the tofu texture remains after deep-frying. Thick deep-fried tofu is cooked one by one by hand. It is a protein rich soy product, ideal for people who prefer a vegetarian and vegan diet. Thaw in the refrigerator. As the oil used to fry these deep-fried tofu is fresh and not oxidized, they don’t need to be rinsed under hot water as you would do with other brands. 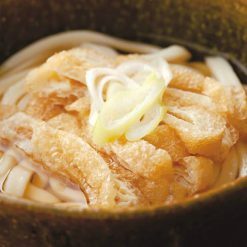 It can be used in many dishes including miso soup, vegetable stew, and hot pot. The simple way to enjoy it is lightly roasting it in a toaster or on a pan, cutting them into smaller sizes and topping them with soy sauce or ponzu, with grated ginger, grated daikon radish and chopped green onions.